Located at the Village at Squaw (right by Uncorked), this swap benefits a local nonprofit that uses the act of riding a bike to better both our local community and communities in need worldwide. You might remember the group’s do-goodings from our post on cleaning up the Truckee River last fall. Twenty percent of every sale at this swap benefits the nonprofit, and a $3 entry/donation gets you in to browse the goods. Drop-off your equipment to sell Friday from 5 to 9 pm, or Saturday morning from 7 to 9 am. All biking-related items accepted. This swap features lots of used bicycles, including parts/pick & pull. There’s also an air pressure, brake and chain check sponsored by Kiwanis Bikes so be sure to stop by regardless of your gear needs. The Tahoe Mountain Sports team will be there too, selling new gear including bike baskets, bike bells and Keen bike shoes. An on-site ice cream social and bake sale benefit the Children’s Network. $3 entry for adults, children under 12 are free. If you have a bike and/or parts to sell, drop them off from 9:30 to 11 am, pick them up 4 to 5:30 pm. After 5: 30, it’s a donation. This South Lake Tahoe bike swap is a great place to find used bikes and gear, plus you’ll have the whole shop to look around for new items. A BBQ will also be going on at the shop as the whole town will be out celebrating the Amgen Tour of California Stage 1 start here. Expect the whole lot (cruisers, road bikes, mountain bikes, fixies) at this popular Reno swap. Plus, the day is a full-on celebration of all things bicycle, with an expo of local cycling clubs, groups, organizations, and teams; rides; a kid’s rodeo; music and food; raffles and awards; and games. 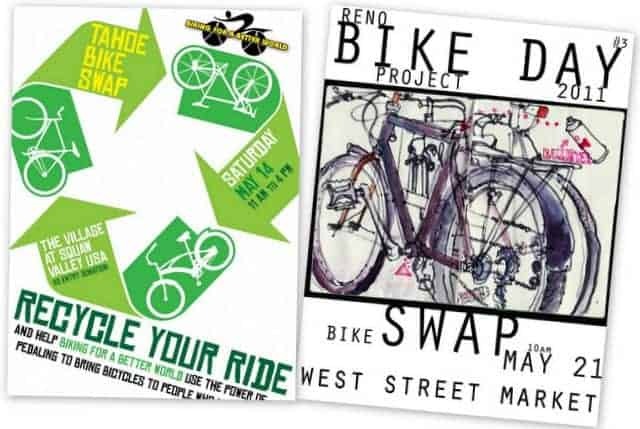 Reno Bike Project will sell your bike at the swap for 20 percent consignment and parts for 50 percent consignment. Items to sell can be dropped off the day of the event or at the Reno Bike Project shop on East Fourth Street two weeks prior. Previous PostTop 10 spots to watch the Amgen Tour of California in Tahoe and Truckee Next PostReno River Festival - Look for TMS, Keen and Outdoor Research!